Harvey is finally moving away from the Gulf Coast. While a few showers connected to Harvey may occur through Thursday, little to no noteworthy consequence is expected. Only the Amite River at Maurepas and the Tangipahoa River at Robert will make it into minor flood stage, all other gauged locations will remain below bank full. Today and Tonight: Alas, the area is transitioning away from weather influenced by Harvey. Thursday will bring partly sunny skies with just a few showers and thunderstorms—not as heavy, and not as widespread as earlier in the week. 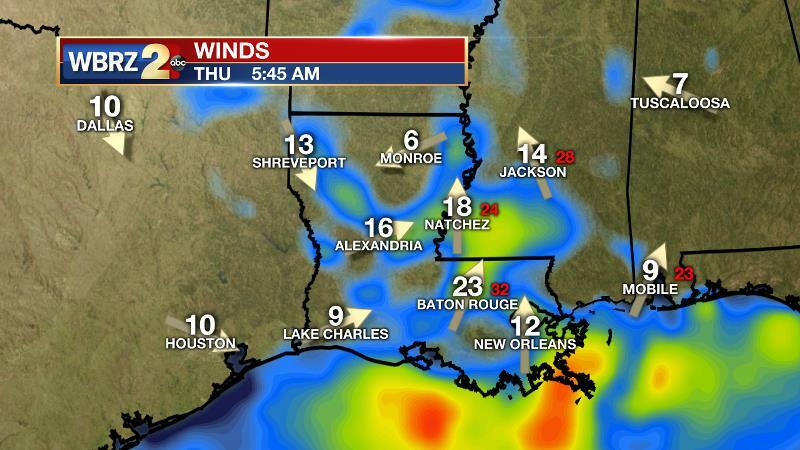 Winds will be elevated early—out of the southwest at 10-20mph. High temperatures will make it into the middle 80s. Thursday night will be partly cloudy with low temperatures in the lower 70s. Up Next: Relative to the recent stretch of weather, rather pleasant conditions are expected for the upcoming weekend. Friday through Sunday will feature partly sunny days with only an isolated shower or thunderstorm possible each afternoon. High temperatures will make a run at 90 degrees although humidity may ratchet down slightly. Low temperatures will be in the low 70s. Unsettled weather will return early next week followed by a potential cold front with some nice changes (more on that below). The Tropics: Harvey is all but a goner. The tropical depression will produce rain and wind in the Mid-Mississippi River Valley to Ohio Valley through Saturday but influence on Gulf Coast weather is quickly diminishing. 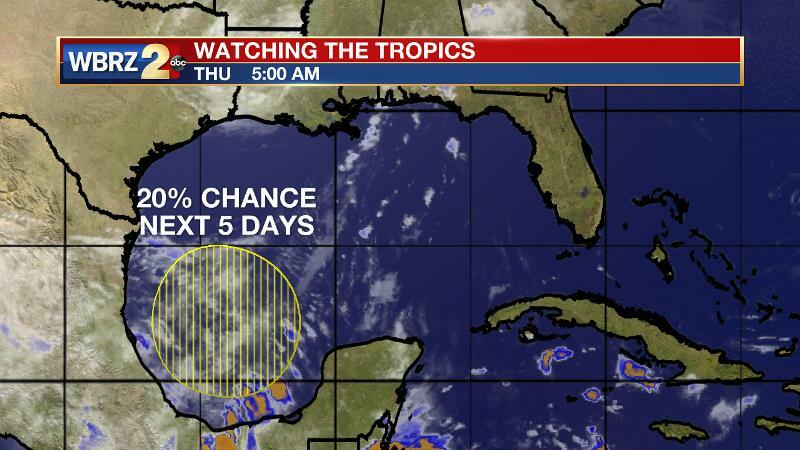 A weak disturbance in the southwestern Gulf of Mexico is now being monitored as well. While considerable organization is not expected, as this area moves northward rain may return to the flood stricken western Gulf Coast. It is much too early for any definitive forecast on this system, but is something to watch. Hurricane Irma has rapidly intensified into a category two storm. With a minimum central pressure of 979mb and maximum sustained winds of 100mph, the system was moving west, northwest and 10mph. 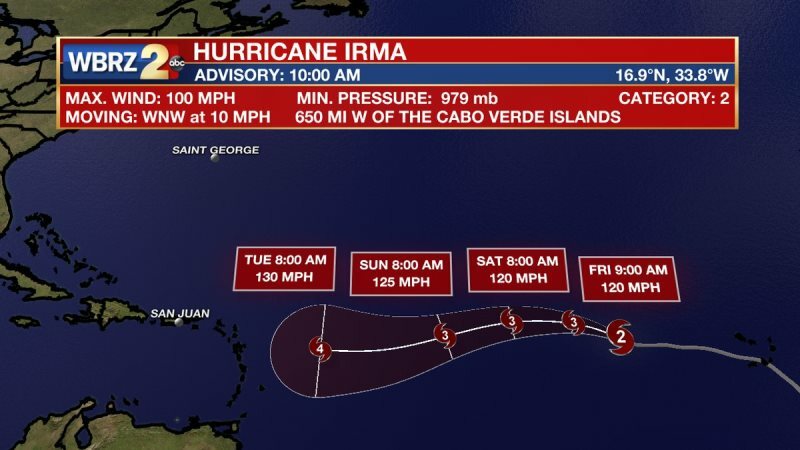 Irma is forecast to become a category four hurricane with potential to reach category five status. It is still too soon to forecast track beyond the Leeward Islands, but the United States will need to monitor this one very closely into next week. Conditions will continue to improve today as Harvey continues to lift northward, away from the Baton Rouge area. The tropical rain bands will not be as heavy and will drop from the scattered to isolated category with about 40 percent of the 13 Parish 3 County forecast area receiving measurable rain. Winds will decrease as well. By Friday, an upper level trough left in the wake of Harvey will remain in place across the forecast area, but a much drier air mass will considerably curtail convective development. A weak surface high will build in on Saturday and last through the weekend. As a result, Friday through Sunday will result in typical late summer rain coverage of 20 to 30 percent—limited to the afternoons during peak heating and maximum sea breeze interactions. High temperatures will be close to normal, in the upper 80s and lower 90s. An inverted trough and weak surface low in the Gulf of Mexico will begin to increase rain coverage into next week. The increased instability with a return of tropical moisture will allow scattered showers and thunderstorms to develop mainly inland during the days and mainly coastal during the nights. Looking beyond that, there are a number of interesting scenarios possible according to the forecast models by the end of next week. First and foremost, we may need to keep a close eye on Tropical Storm Irma. There seems to be potential for this storm to become quite strong in the Atlantic Ocean. It is not yet known what will happen from there. Second, a late summer cold front may approach the area during the middle of next week. 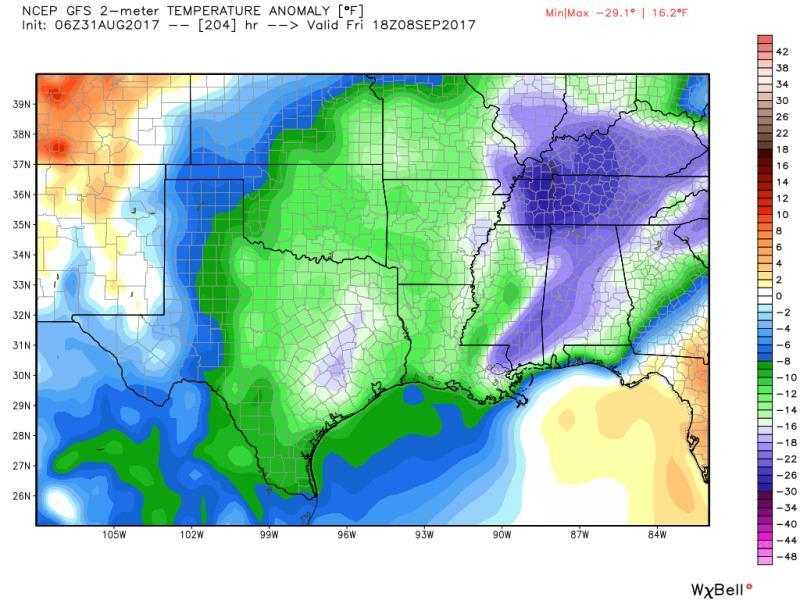 Forecast models are hinting at temperatures running 5-10 degrees below average for the time of year, which could mean highs in the low to mid 80s and lows in the mid 60s. Humidity would take a break too. This could lead to cooler and drier weather just in time for next weekend. As always, the WBRZ Weather Team is here for you, on every platform. Your weather updates can be found on News 2, wbrz.com, Facebook, Twitter and the WBRZ WX App. on Apple and Android devices.